Wiebe Jans van Douwen was born 9 April 1846 in Dokkum, Dutch province of Friesland, and died 20 August 1912 at the Hague. He was a student at the Mennonite seminary and the university in Amsterdam, 1865-1871, and was a man of thorough scholarship. He was pastor of the congregations at Borne, 1871-1874; De Rijp, 1874-1887; Bolsward, 1887-1892; and Almelo, 1892-1911. He was the author of the work, Socinianen en Doopsgezinden, Doopsgezinde Historien uit de Jaren 1589-1626 (Leiden, 1898). He also translated a work written in the sixth century by John Bishop of Ephesus, on the life of oriental saints of the monophystic sects from Syrian into Latin. It was published by the Royal Academy of Sciences in Holland in 1889. Catalogus der werken over de Doopsgezinden en hunne geschiedenis aanwezig in de bibliotheek der Vereenigde Doopsgezinde Gemeente to Amsterdam. Amsterdam: J.H. de Bussy, 1919: 109. Doopsgezind Jaarboekje (1922): 21-29, with portrait. Hege, Christian and Christian Neff.Mennonitisches Lexikon, 4 vols. Frankfurt & Weierhof: Hege; Karlsruhe; Schneider, 1913-1967: I, 471. Visscher, H. and L. A. van Langeraad. Biographisch Woordenboek von Protestantsche Godgeleerden in Nederland. Utrecht, 1903- : II, 571-573. Neff, Christian. "Douwen, Wiebe Jans van (1846-1912)." Global Anabaptist Mennonite Encyclopedia Online. 1956. Web. 22 Apr 2019. http://gameo.org/index.php?title=Douwen,_Wiebe_Jans_van_(1846-1912)&oldid=144078. Neff, Christian. (1956). 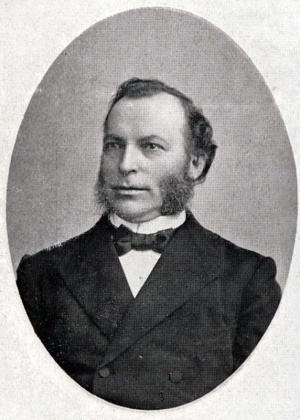 Douwen, Wiebe Jans van (1846-1912). Global Anabaptist Mennonite Encyclopedia Online. Retrieved 22 April 2019, from http://gameo.org/index.php?title=Douwen,_Wiebe_Jans_van_(1846-1912)&oldid=144078. Adapted by permission of Herald Press, Harrisonburg, Virginia, from Mennonite Encyclopedia, Vol. 2, pp. 95-96. All rights reserved.